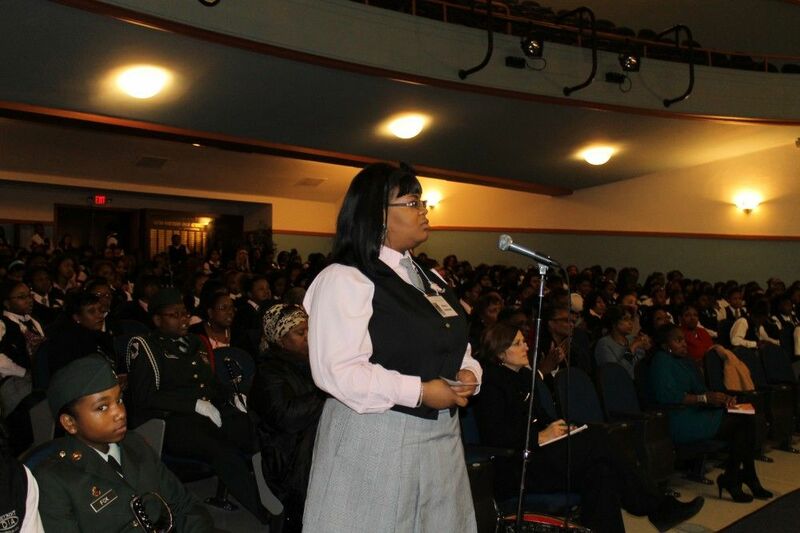 The Anita’s Aspiring Attorneys club of Detroit International Academy for Young Women, a K-12 all-girls public school, welcomed their club’s namesake today when Professor Anita Hill addressed the school’s high school students. The nearly two dozen members of Anita’s Aspiring Attorneys welcomed Hill with a special breakfast reception before she addressed the entire high school, sharing lessons learned throughout her life. Hill encouraged the young women of DIA to continue the battle for gender equality that their predecessors have fought. 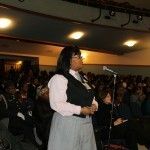 Hill recalled her personal role models in the legal profession, and encouraged the aspiring attorneys to seek not just legal role models, but those close to home, such as teachers, their principal and relatives. At the same time, she urged students to avoid imitating their role models, but to be the “best ‘you’ you can be” by working hard and making good ethical and moral choices. Hill shared stories about her childhood in Oklahoma at a time when there were few female lawyers of color. She sought information about “strong women with strong voices” to inspire her, and encouraged the DIA students to do the same. Calling her visit to DIA the highlight of her brief trip to Detroit, Hill said she was impressed by the young women of DIA — particularly the Color Guard and ROTC Corps, who welcomed her with a sword salute, a first-time experience for the esteemed attorney. Detroit International Academy also has a heavy emphasis on reading, sponsoring a Book Challenge, where students are challenged to read 100 books or more. The academy also offers competitive sports and activities, such as volleyball, basketball, swimming, tennis, cross-country, cheer, citywide dance, and a JROTC battalion, whose Color Guard was designated first place in the district.